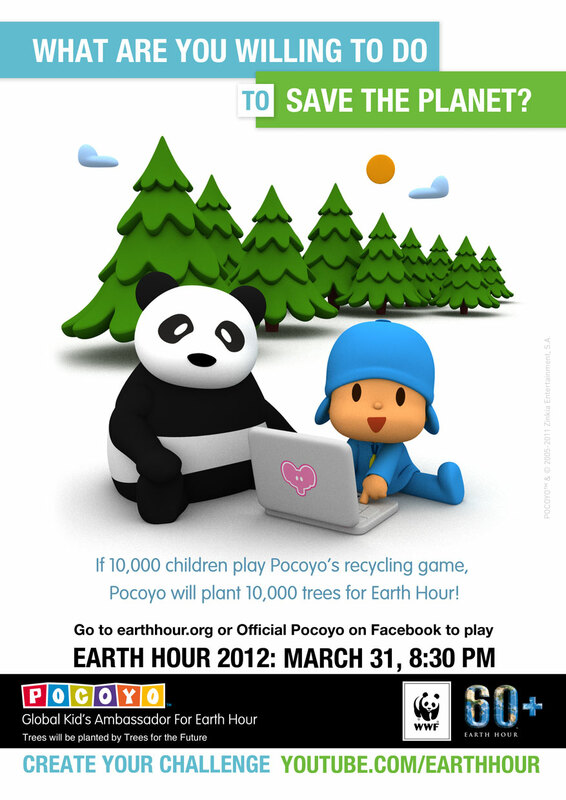 Celebrate Earth Hour with POCOYO on March 31! Play the Pocoyo Recycling Game and They’ll Plant 50,000 Trees! Plus #WIN Pocoyo Fun & Games DVD #Giveaway! Pocoyo is this years Global Kids’ Ambassador for the World Widlelife Fund’s Earth Hour 2012 “I Will if You Will” campaign to spread Earth Hour’s message to children around the world thorough fun activities and by participating in their own challenge. It’s easy! They’ve already reached 20,000 trees for Earth Hour, now if 100,000 people play Pocoyo’s recylcing game, Pocoyo and his friends will plant 50,000 trees for Earth Hour! How wonderful is that?! All you have to do is play the Pocoyo recycling game, visit www.earthhour.com and play and they’ll be one step closer to planting 50,000 trees. Green Tips for at Home and Around Town! Have a candlelight “family hour” at least once a week & play board games in lieu of TV. Reduce your water use — Take shorter showers, turn off the tap when brushing your teeth, install water saving shower-heads and dual-flush toilets, repair dripping taps – all these things add up! What would you be willing to do to help save the planet? Visit the YouTube Earth Hour Challenge and see what you can do to help save the planet. One brave person is willing to shave their head if 5000 people sign on to Earth Hour. Another says she’ll wear whatever her daughter tells her to if 5000 commit to recycling in 2012. Ask your readers to “take up the challenge” at http://www.youtube.com/earthhour and post their own challenge. Make invitations out of recycled paper or send an email invite. Use organic and locally sustained food. Serve finger foods to skip using plates and utensils, and use cloth napkins that can be washed and used again. Make dishes that don’t require the oven or electricity to prepare. Be creative with food, ie, licorice ends can be cut off to make edible straws for the kids. Family craft project – try making the special Keepsake holder out of an old cereal box (see instructions below). Have a nighttime, outdoor, eco-friendly scavenger hunt by flashlight – hunt for recyclable items like milk cartons, egg cartons, etc. Once the items are found, explain how they are used for recycling and to save our environment. Have a recycled book exchange for the kids and adults, instead of favors. Have fun and remember to have enough candles and flashlights for everyone to see! Also, be sure to checkout the POCOYO Activity Booklets for download and POCOYO Earth Hour screensavers and wallpapers for FREE at http://www.POCOYO.com/earth_hour_2012.html! Now, here is your chance to WIN Pocoyo Fun & Games on DVD! POCOYO, the fun-loving, curious little boy with a big personality. Watch as he explores, plays games and has fun with his friends Pato, Elly, Loula and Sleepy Bird. Viewers can join them as they stage their own version of the Olympics, create a magic show and ride the new, big, scary slide in the playground.To enter fill out the Rafflecopter form below. This giveaway ends on 4/22 at 11:59 PM EST. This is not a paid post. Pocoyo is providing the DVD to the winner. Something I do to help the earth is instead of using paper towels, I use washable microfiber cloths. They are great for dusting too! We dont litter! And we recycle! I participated in earth hour this year – it was so fun. Also am a big recycler, have a big bag each week. We plant some of our own veggies.